Proudly Serving Families Since 1868! 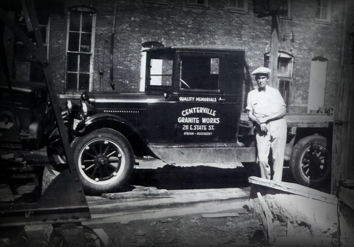 Centerville Monument Company was first established in 1868 by Gus Richard. Gus owned and operated the business for 27 years until 1905, when his son, A. Richard took over the business and continued for the next ten years. All the stone cutting was done by hammer and chisel until 1910, when the first air hammer was purchased by the shop. The moument company changed hands several times over the next couple of years, with owners including J.W. Campbell and Joe Turner. Turner owned the shop for roughly 15 years, and then in 1925, the company was purchased by Pete Legge. In 1927, the first sandblasting machine was purchased for lettering monuments, which greatly reduced the time of production, as well has time spent on hand cutting with chisels. Frank L. Roseberry purchased the monument company in 1928, and owned and operated the business until 1930, when he sold it to C.E. Eggert. Eggert moved the company to it's current location across from Oakland Cemetery in Centerville immediately after purchasing the company. In 1933, John Maring joined Eggert as a partner in the then named Centerville Monument Works, and were able to employ five men for several years. Centerville Monument Company went through several owners throughout the years after Eggert. Those owners included Patterson Bros. in Ottumwa, Bill Johnson in 1955, and his brother Harold "Brownie" Johnson in 1958. In 1967, the compressor that ran the sandblast machine blew up, causing the original building to burn down. Brownie built a new building and installed new equipment which was still used until 2012. In 1972, Brownie Johnson sold the company to Guy Goughner, which operated the business until selling to Wayne Frericks. Mr. Frericks, unfortunatly, passed away at 31 years of age from a heart attack, which lead to the purchase of Centerville Monument Company by the current owners, Jerry and Cathy Whisler in 1989. Jerry, with a degree in Business, and Cathy, with a degree in Business and Art, brought their skills and experiences to Centerville Monument Company, and have been successfully operating ever since. With state of the art design and engraving equipment, as well has hand crafted drawing and etchings, Centerville Monument Company specializes in creating skillfully crafted, fully customizable memorials for families in southern Iowa and northern Missouri.